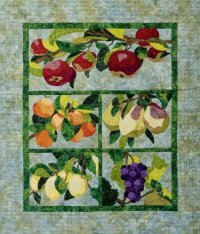 Beginning in March 2019, the Table Runner Club provides one seasonally themed table runner in a kit complete with the pattern and fabric (backing not included) to make the table runner. Each table runner comes packaged in a lovely keepsake box. At the end of the program, you’ll have 12 festive table runners, perfect for every gathering area and every season! May runner available late March. Here's a link to the runners you'll be making. $35/month; enroll today! This Block of the Month features ombre fabrics! 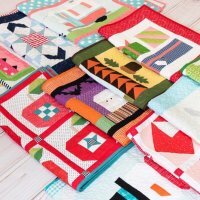 Each block uses one ombre fabric and a solid background, giving you a range of color changes just by cutting your strips as you normally would for any other quilt. But thanks to the gradual color change, you look like a fabric selection rock star! The design is made entirely of half square triangles, quarter square triangles and flying geese, making it appropriate for a confident beginner, with no special tools required. January start; now enrolling. $30 registration (covers your pattern booklet); $15 a month. Quilt finishes to 80" square. Capture the brilliance of colored gemstones in this 12-month BOM titled The Birthstone Series. 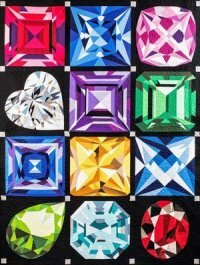 The series, beginning in January 2019, includes 12 freezer paper piecing patterns for 17" blocks representing all the traditional birthstones. Each pattern has a skill builder component offering a unique opportunity to learn new techniques (soft curves, set in seams, small pieces and diamond shapes). We’ll review these in our monthly meetings. $35 per month includes pattern and fat quarter fabric bundle. Note: We highly recommend you take the Birthstone Bling class if you plan to participate in our block of the month/birthday club to make all twelve birthstones. You will only be responsible for purchasing the other 11 bundles/patterns in the series! Our monthly club meetings will not cover detailed instructions. We will review tips and tricks for that month’s gem and share ideas for other projects. A unique block of the month design by Barbara Persing. Raw edge applique technique. 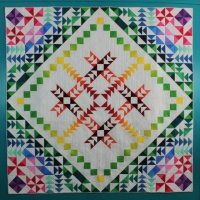 6-month program begins late spring; quilt is 53in x 62in. Kick off class with Barbara Persing for month one apple block coming in June; stay tuned for details! Begins in January! 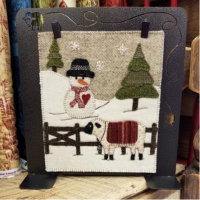 Make a small wall hanging with wool applique every month and display it in this adorable sheep stand. Each block finishes to 8" x 9." Your kit includes the pattern and all the hand-dyed wool you need to complete the block. $25 each month. Reserve the stand when you sign up for $24.